Psychologist Mihaly Csikszentmihalyi's famous investigations of optimal experience have revealed that what makes an experience genuinely satisfying is a state of consciousness called flow . During flow, people typically experience deep enjoyment, creativity, and a total involvement with life. In this new edition of his groundbreaking classic work, Csikszentmihalyi demonstrates the ways this positive state can be controlled, not just left to chance. Flow: The Psychology of Optimal Experience teaches how, by ordering the information that enters our consciousness, we can discover true happiness and greatly improve the quality of our lives. From the Back Cover Psychologist Mihaly Csikszentmihalyi's famous investigations of optimal experience have revealed that what makes an experience genuinely satisfying is a state of consciousness called flow . During flow, people typically experience deep enjoyment, creativity, and a total involvement with life. In this new edition of his groundbreaking classic work, Csikszentmihalyi demonstrates the ways this positive state can be controlled, not just left to chance. 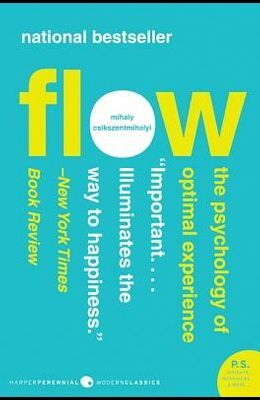 Flow: The Psychology of Optimal Experience teaches how, by ordering the information that enters our consciousness, we can discover true happiness and greatly improve the quality of our lives.